Length: Length: 111,790 words (406 pages) approx. Following the horrific death of his wife and child, Robert Adams struggles to rebuild a life with his seventeen-year-old daughter, Jenny. Their relationship is tested further when she expresses a desire to contact her mother through a spiritualist and he watches helplessly as they slowly drift apart. But everything changes when Jenny begins to dream - dreams which take her into another world - a world inhabited by a young girl, imprisoned in a dark attic. A girl Jenny believes is an ancestor whose spirit is reaching out across the generations. But who is she? What does she want? As Jenny's behaviour becomes increasingly dangerous and unpredictable, Robert finds himself confiding in Sebastian Tint - an old professor who claims to possess a sixth sense. Together, they employ retired genealogist Jack Staple to trace the family tree - but it is a journey that takes Robert down a road of discovery that threatens to tear their world apart. Finding Amelia is a compelling read, from start to finish. It is narrated by Robert Adams - the main character - in first person, and he is a seriously flawed narrator. There were times when I wondered if his indiscretions might do more than merely catch up with him, but there's something about him that keeps him redeemable in the reader's eyes. The story unfolds following the death of Rob's wife and youngest child, and it's a trip to hell for both Rob and Jenny - his seventeen-year-old daughter. Rob's grief is tangible; he has some great support around him, yet he is alone and lonely, as is the way of grieving, the author's portrayal of which is gritty and real. 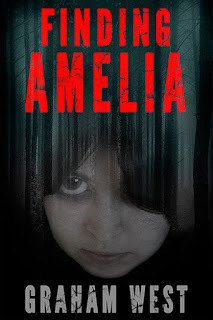 The supernatural mystery is 'fun' to follow - inverted commas because the events surrounding Amelia's persistence are not fun at all. We readers find out what is happening as Rob does, albeit with the benefit of emotional distance, always with the question hanging over Jenny's sanity, and, by extension, Rob's. I really loved some of the secondary characters - Sebastian is my favourite character, even above Rob. Josie is lovely but a typical know-it-all psychologist type, and at times, I wished she'd keep her opinions to herself. Of course, my irritation wouldn't be possible if the characterisation wasn't excellent throughout. Even better, the sequel is now in editing! Finding Amelia has a firm conclusion and ties all the major loose ends, but I can't wait to find out where Rob and Jenny's journey takes them next. Graham West studied art at Hugh Baird college in Bootle, Merseyside, before joining the display team at Blacklers Store in Liverpool city centre where he spent seven years in the art department before moving on in 1981 to become a sign writer. He lives in Maghull with his wife, Ann, and has a daughter, Lindsay, and two grandchildren, Sonny and Kasper. Graham also plays guitar at weddings, functions and restaurants. He took up writing in 2000 and has had a couple of factual articles published in magazines. Finding Amelia is his first novel.